When you have your hearing tested at a hearing healthcare professional, the results will be recorded onto a graph called an Audiogram. Your audiologist should explain all of your results to you in detail after your test, and you may choose to take a copy of your audiogram home with you. We know, however, that many people find that there is too much information to absorb everything! 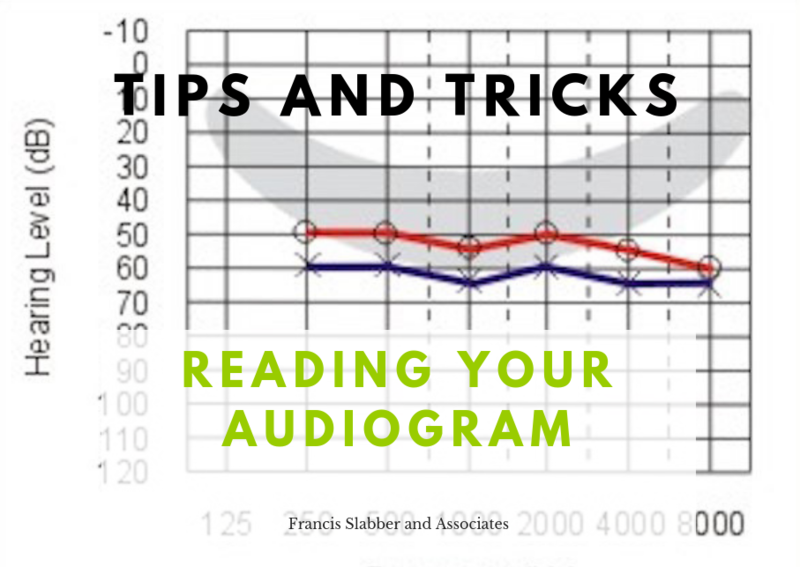 Here are some tips on how to read your audiogram to best understand your hearing assessment results. If you have a colour copy of your audiogram, you should see marks in red and marks in blue. The red marks signify the results from the right ear, and the blue marks the results from the left ear. These marks are also unique symbols- circles or triangles represent the right ear and crosses or squares represent the left ear. The Pure Tone Audiogram is recorded on two vertices- the vertical shows intensity, or loudness, and the horizontal shows frequency, or pitch. The frequency is recorded in Hertz, from the low frequencies on the left to the high frequencies on the right, just like a piano. The intensity is recorded from very soft at the top, to very loud at the bottom. For each frequency, the softest sound that you consistently respond to is recorded, and then the marks are linked together to form a graph. Everything that you cannot hear falls above the line, and the higher the line is to the top of the graph, the better your hearing. Marks made at 20dB or less indicate normal hearing at that frequency, and marks made at greater than 20dB indicate hearing loss. We describe your hearing based on whether it is in one ear or two, whether the two ears are symmetrical, how severe the loss is, the configuration or shape of the loss, and the type of hearing loss it represents. There are so many variables, depending on how far away your results are from the normal range and at which frequencies. For this reason, audiologists will rarely give a percentage of hearing loss, except sometimes in industrial contexts. Ask your audiologist for your full diagnosis to hear a comprehensive description of your loss, as well as recommendations for management. Together with your pure tone audiogram you should find the results of your speech recognition test and possibly immitence testing. These results give us information about reliability, your ability to hear and understand words, and the status of your middle ear, to name a few. The speech recognition test shows us whether your ears (and your brain!) are able to hear 100% of speech words correctly with increased volume. It helps us to get an idea of how well you might do with hearing aids, and can reveal risk factors for what we call retrocochlear dysfunction- problems above the level of the inner ear. Reading your own audiogram can be overwhelming and confusing. It’s always best to book an appointment with an Audiologist who can explain all of the different elements in detail. Don’t be nervous to ask for help- understanding your hearing loss is the first step towards hearing better.